1. Free download latest version DVD to Zune + Zune Video Converter. You can konw more features about it by referring to here. 2. Insert the DVD you’d like to convert to the DVD drive. 3. Click ‘File’ menu and ‘Open DVD’, or directly hit ‘Open DVD’ button to load the DVD. 4. Click around in the DVD’s menu to set up DVD playback as you like, then begin to play the movie through the software. 5. The following window will pop up. Here, you can rename ‘Title Name’, set ‘Save Path’ and output quality, then click ‘Yes’ button to start ripping DVD to Zune WMV or Zune MP4 video from the point that the movie starts. That is all. Just so easy! If you’d like to record from certain time point, or want to change some parameters like ‘output format’, ‘video bitrate’, ‘frame rate’, ‘audio bitrate’, please click ‘No’ button to close the window. Click ‘Subtitle’ or ‘Audio Track’ in the ‘Setting’ menu, choose the related value you like. Choose the target file format from ‘Profile’. The software supports converting DVD to Zune WMV, Zune MP4, Zune H.264, Zune audio WMA, Zune MP3 and Zune TV size. Use the video playback controls to queue up the point at which you want to start ripping. Or click ‘Setting -> Go to’ and jump to previous/next chapter. Click ‘Setting -> Output video settings’, here you can choose different profile, video/audio bitrate, video size, disable video/audio, aspect ratio, frame/sample rate, etc. 7. 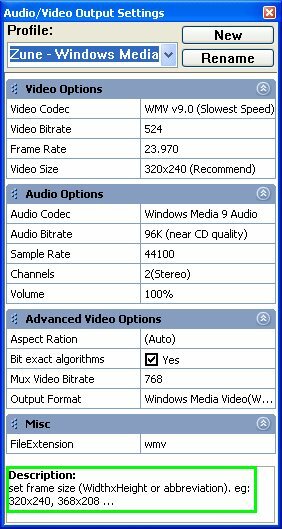 Hit ‘Convert’ button, choose the recording time point and quality, then click ‘Yes’ to begin to convert DVD to Zune video or audio quickly. 8. After ripping, transfer the converted files to Zune software, and then sync to your Zune player. 1. Free download latest version DVD to Zune + Zune Video Converter from here. 2. Click ‘Open file’ button to load the video file(s) you’d like to convert. The Zune converter software supports batch conversion mode. 3. The default output format is Zune WMV video. If you’d like to change this, click “Advance” button, set the output format to Zune video (Zune MP4, Zune WMV, Zune H.264, Zune TV) or Zune audio (MP3, WMA). Here, you can also set video size, frame rate and more. 4. Hit ‘Convert’ button to start converting video to Zune. 5. Transfer the converted video or audio files to Zune software and put them on Zune player.